Our family loves car trips, and as the one who makes the arrangements I am the one doing the road trip planning. Since we have been on so many with our boys (10 since they were 4 months old) we now have all of the plans in place to make the trip as easy and fun as possible! The days of flying by the seat of your pants and just driving are gone when you decide to take your kids. We have found that mapping your trip, picking out hotels and booking some are a great way to start. We always order a Triptik from our local CAA to give us a mapped out route. I love being able to just flip a page to see what is coming ahead. Just remember to order yours at least a week in advance since they are custom made. While there are thousands of hotels to chose from choosing one that accommodates families and includes breakfast is key to a great sleep and a great start to the day. Our hotel of choice? Hilton Garden Inn Great hotels (over 500 to choose from worldwide), a refrigerator and microwave in every room, complimentary internet access, family friendly extras like cribs, high chairs and playpens and best of all – a beautiful cooked to order breakfast every day. If you haven’t had their waffles, you must make that a priority! When we head out on a car trip we always pack the boys favorite snacks and lots of toys to keep them entertained. 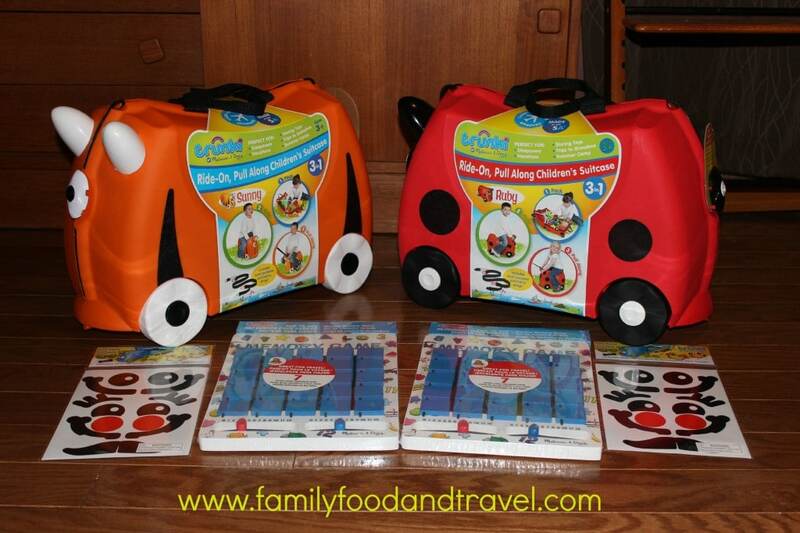 From long days in the car to restaurants along the way, kids need fun, interactive toys. 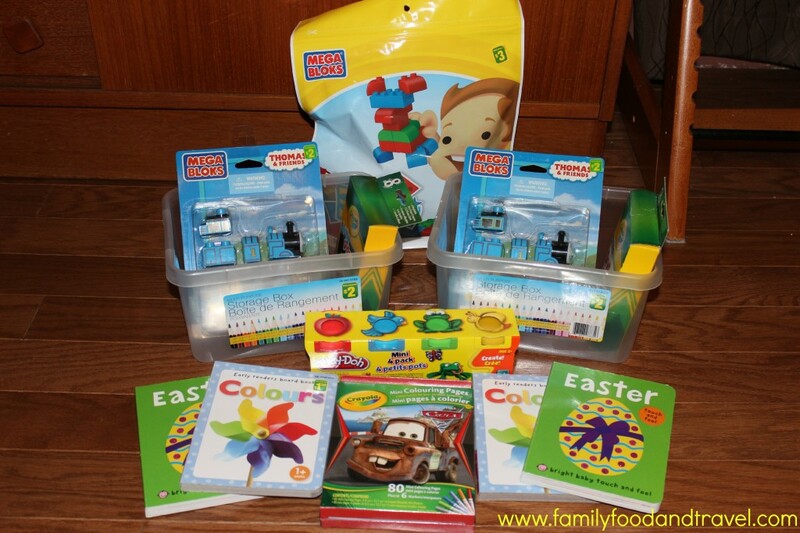 We love to pack activity boxes full of new fun and inexpensive toys. 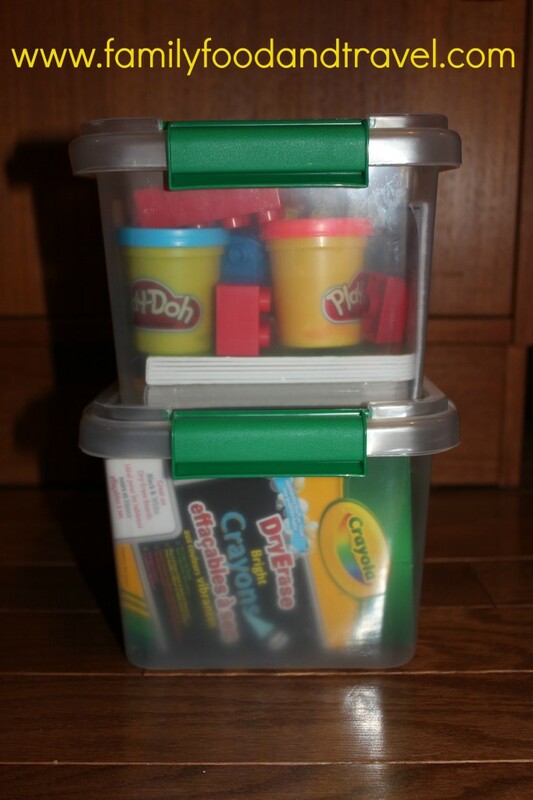 This trip we got containers with handles that the boys could carry themselves and filled them with all kids of goodies from our local dollar store and craft store. All of this fit into their activity packs! While you may be tempted to just drive and drive until you get to your destination, frequent stops will keep you and your kids sane. Kids need to run around, explore, and get a change of scenery. Well timed stops can give everyone a chance to stretch their legs and gear up for the next leg of the journey. Most road trips could be taken with just some money and your passport. In my experience this doesn’t work very well when you have kids along for the ride. Kids inevitably need more clothes than adults do. They spill things, they often wear more than one outfit in a day and in the case of my 3 year olds, are very particular about what clothes are their favorites and which clothes they will not wear without at least one tantrum. To making packing easier, for this trip we bought the boys super cool Melissa and Doug Trunkis and we LOVE them! We haven’t even left for our trip and the boys have been driving them all over the house. I love that the boys can sit on the them while we pull, or they can maneuver it themselves. I honestly believe these are the best luggage available for kids. Durable, practical, and fun! 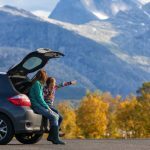 Road trips with kids are fun, full of adventure and a wonderful time to be together as a family. While many of our friends think our upcoming 6 day journey is crazy, we think it is the perfect way to spend our holiday. What are your tips for road trips with kids? Great tips! I love the Hilton Garden Inns, they are so much nicer than the other choices and give you so much more value! I hope you all enjoy your trip! So true Elizabeth! Great value and a fantastic hotel! Travelling with kids can be a joy if you’re well prepared. Sounds like you’ve got everything covered. Starting the day with a good breakfast is key! Road trips provide so many family memories. Have a wonderful trip! Susannah – I miss those days when you could just get in the car and go. Now with kids it takes a lot more planning – but so worth it! Thanks for sharing your great list! Rosey recently posted..Do You Use a Planner? They are so fun! My boys have been pushing their Trunki’s all over every hotel we’ve been too! 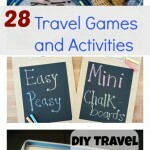 I take several road trips with my kids too and could be a bit more organized. I need to make some activity boxes like the ones above! Thanks for the tips. Have a great trip Kerrie! My son also has his Trunki and absolutey loves it. He really likes being pulled on it in big airport spaces. I just recently wrote a post about it. 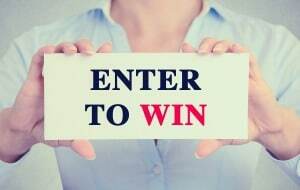 I will keep coming back to your blog see what other great tips you put up! These are some good tips and I practice them often. I never leave the house without snacks in my bag and water on me. There is also a stash of books and audio CDs that I use if we get caught in traffic. Thanks for sharing this and I know it will help others. Great idea about the audio books. We don’t have any of those in our travel kit. Will have to add some! I love those trunks. Snacks are another tip I believe in. I bring lots of frequent snacks. Crayons and paper and the DVD player and Nintendo and no worries baby! Great tips! The running around is definitely key! Not gross at all! Totally practical and a great tip!